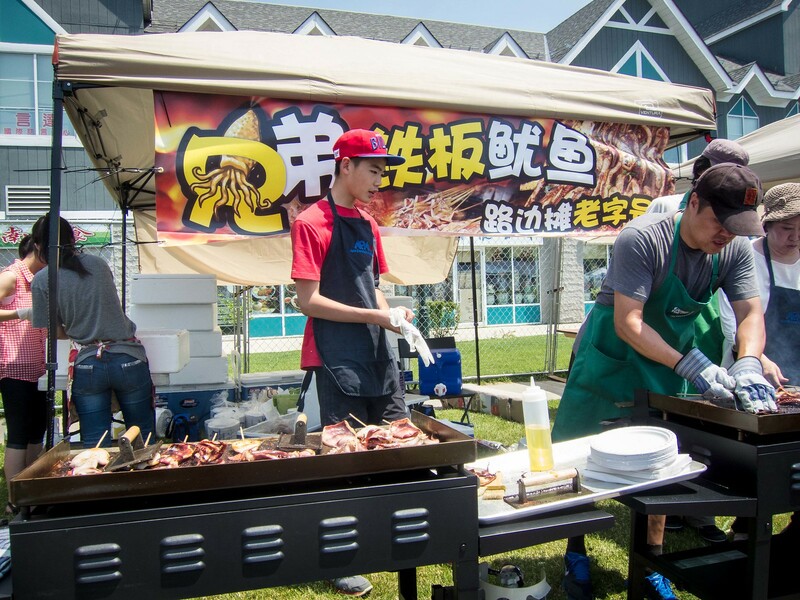 Starting off the summer of Asian food festivals was Taste of Asia. 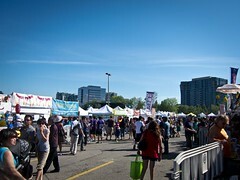 The event ran over the weekend of June 28th and took over a portion of Kennedy Road, right next to Pacific Mall. Two stages are set up, book ending the street, and vendor booths line the space in between. Performances from all Asian cultures (from a Bollywood Show to Thai Boxing) took place throughout the entire weekend on the two stages. I stopped by on the Saturday afternoon to get my fill of stinky tofu and lamb skewers. It was sweltering hot and with the event being on a street, there was little natural shade. The organizers had set up picnic tables with umbrellas near the stages, but they weren’t helpful while you waited in line. I was hoping to beat the crowd by going in the afternoon, but it was already packed at 1pm, lines were long and a lot of the food vendors hadn’t fully ramped up their stoves yet. This meant a good 30-40 minute wait for any of the popular food items under direct sun. I only made it through half of booths before the Fiance and I called it a day. Lesson learned; while crowded at least it’s cool at night. 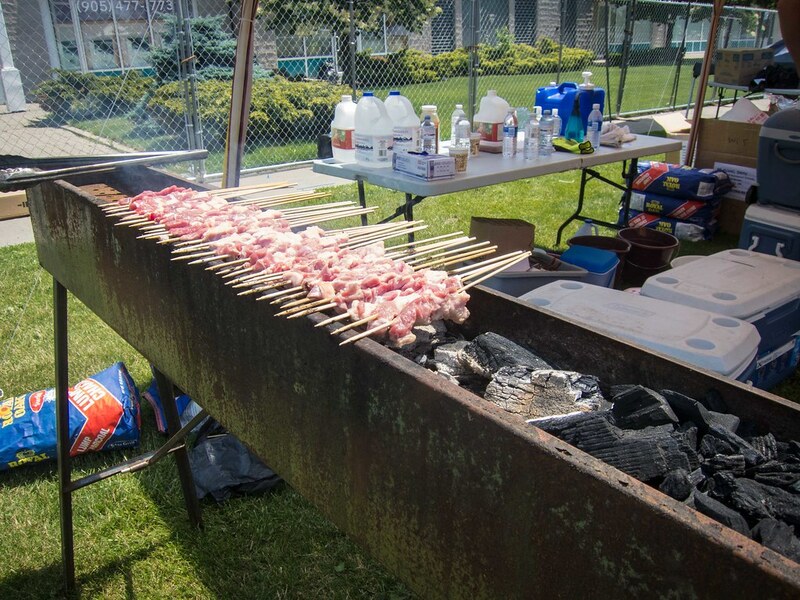 We started off at booth 12, who specialized in lamb skewers and they were delicious, easily the highlight of the day. 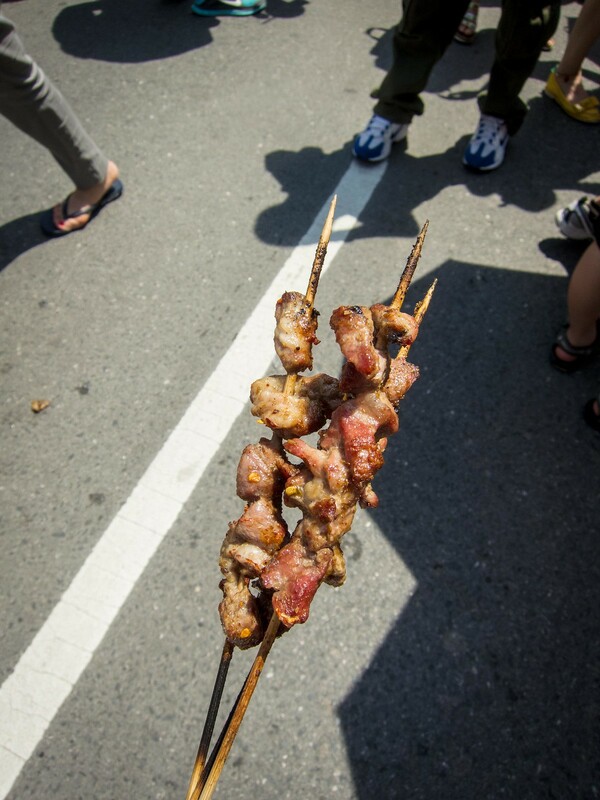 $5 for 3 skewers, grilled, fatty and sprinkled with spicy pepper flakes. 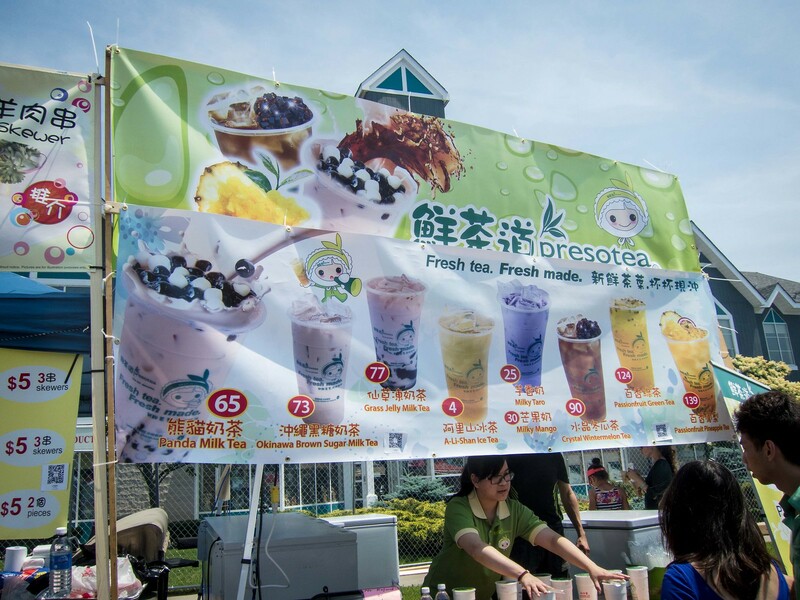 While I waited for the skewers, the Fiance picked up a large Panda Milk Tea from the Presotea booth in an attempt to ward off the heat. The “panda” in the name refers to the black and white tapioca balls used, which taste the same. 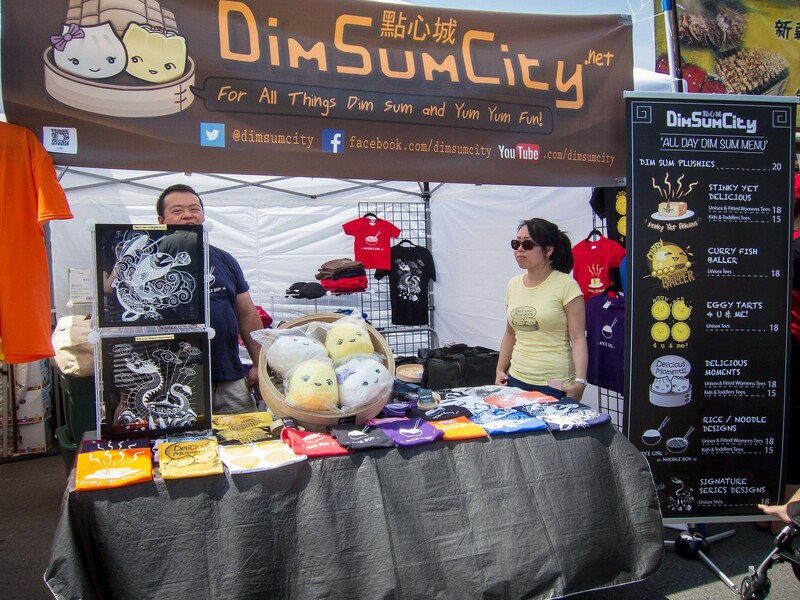 I stopped by DimSumcity’s booth to check out their adorable plushies and t-shirts. Seriously, they have the most adorable stinky tofu t-shirt. 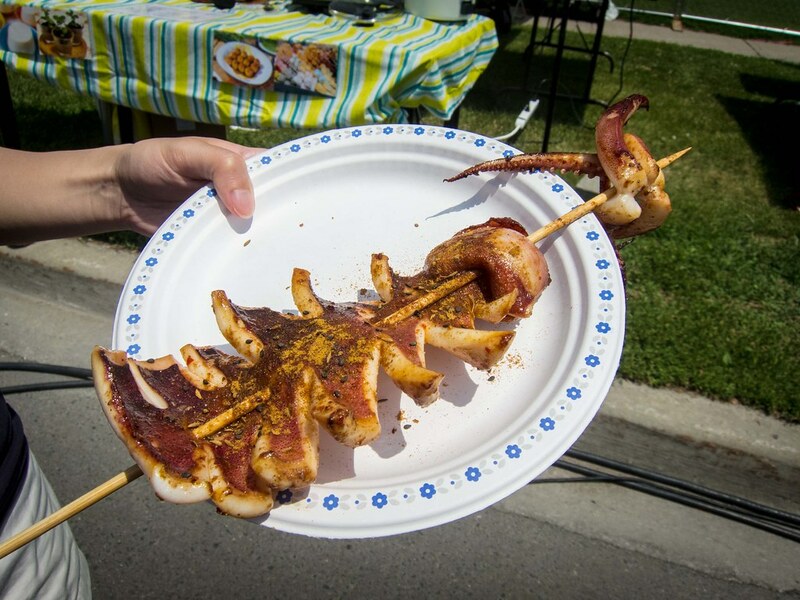 My next stop was a whole grilled squid skewer for $10. 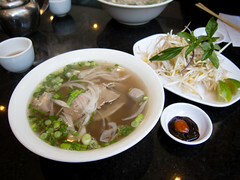 The portion size was large and I really enjoyed the flavours. Some parts of our skewer was a touch undercooked. At the same time, the Fiance queued up for the Barcode booth that, unfortunately, took over an hour and produced under cooked lamb skewers. He couldn’t leave the line because orders were prepaid for. 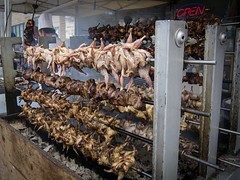 The booth only had one charcoal grill going, which produced a dozen skewers at a time. 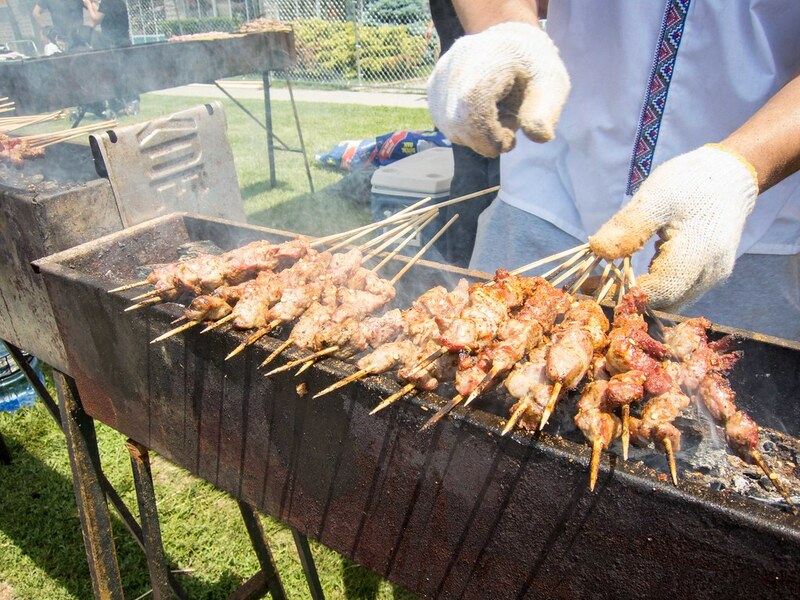 The most frustrating part was the person in front of him who had ordered two dozen skewers, received the first dozen and then proceeded to eat the skewers in line while waiting for his second dozen. Totally valid, but still frustrating. Next up was a skewer of crispy taro chips. I loved the idea and the execution was really tasty. While I waited in line for stinky tofu, The Fiance found a booth offering cold dan dan noodles that were authentic and delicious. 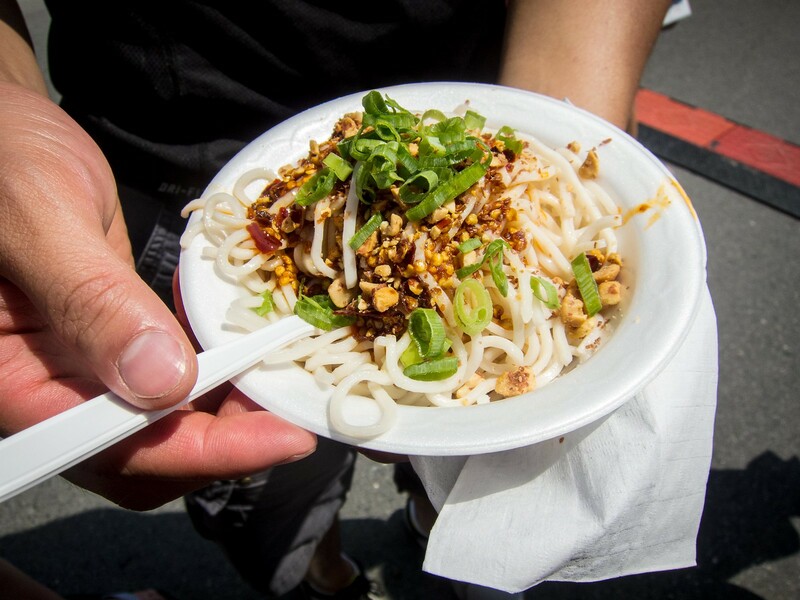 We were looking for new foods to try in addition to favourites and these noodles hit the spot. There was also a booth with a Beijing Yogurt Drink that looked very interesting but I didn’t have the energy to wait in line. Hopefully they’ll be at Night it Up or Waterfront Night Market. 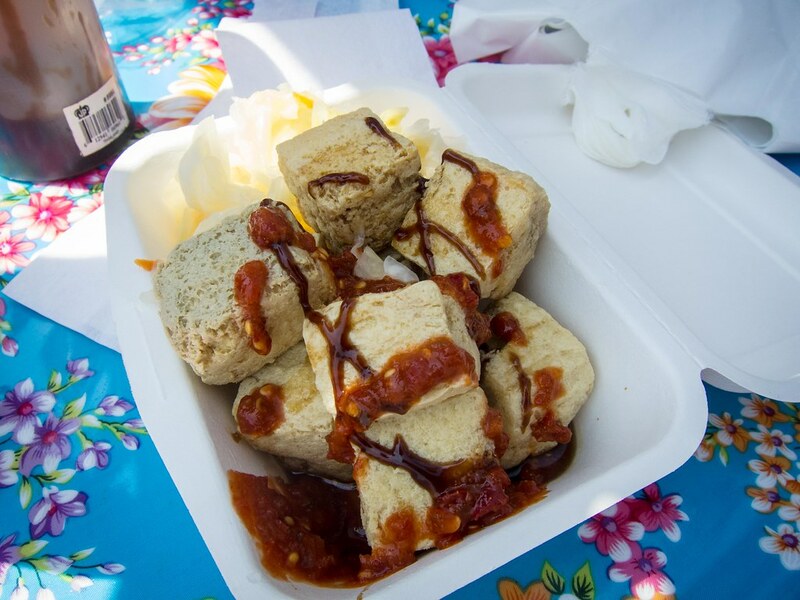 My last stop of the day was Taiwanese style stinky tofu from Mama Bear Taiwanese Cuisine’s booth. 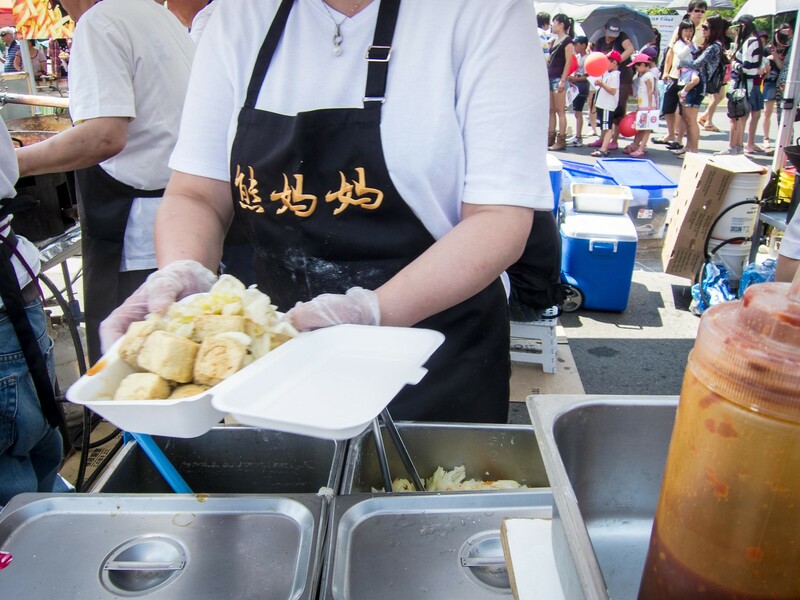 For $7, you got a large tray of stinky tofu with a side of pickled cabbages. Self serve hoisin and hot sauce in squeeze bottles were set up for people to use. 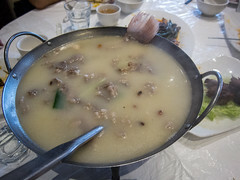 The tofu pieces were well fried, crispy, very stinky and tasted great. 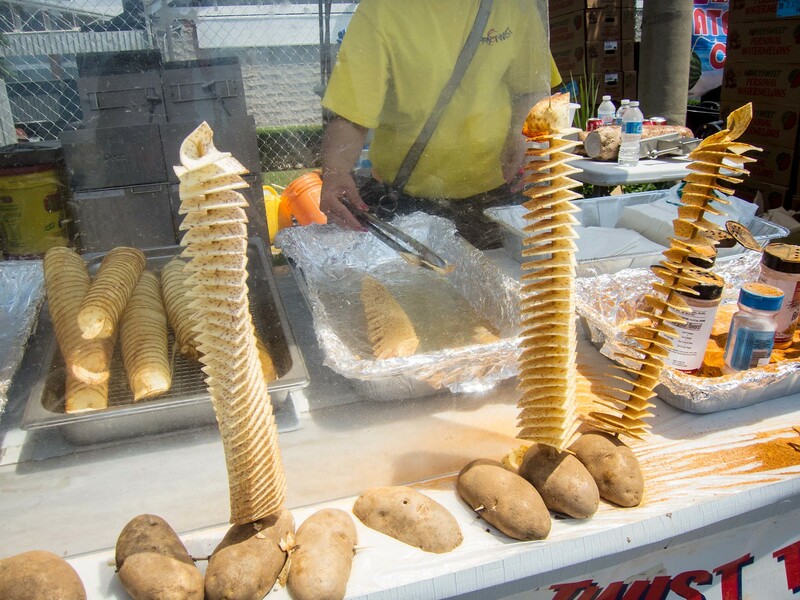 Overall Taste of Asia offered the typical night market foods with some variety in vendors. 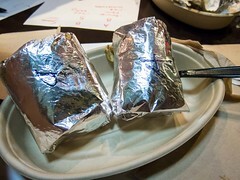 The location close to Pacific Mall means it will always be busy and there’s no real downtime. The many performances were the major draw more so than the food.